Your body depends on proper nourishment to keep it running properly. The foods you eat and the beverages you drink can be among some of the biggest factors in your health, and this includes your dental health. 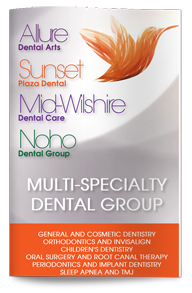 Our expert in dental exam in West Hollywood recommends that our patients make good nutritional choices to get the most out of their smiles. The best dental hygiene may not be enough to protect your smile if you are not eating the right foods or are eating too many of the wrong foods. Sugary and starchy foods are notorious for causing dental problems. These foods tend to stick to your teeth and feed oral plaque, which means they are more likely to cause decay and enamel erosion. Foods that are highly acidic, such as lemons, should also be eaten in moderation. Potentially problematic drinks include soda, wine, energy drinks and fruit juice drinks. The best foods you can eat for your smile include whole, unprocessed foods. Choose fresh vegetables and fruit, whole grains, lean protein and low-fat dairy products, and try to incorporate a variety of foods into your diet each day. Drink plenty of tap water for its enamel-strengthening properties, and limit between-meal snacking. Cheese, fibrous fruits and vegetables, and sugar-free gum can all have protective effects on your teeth and may help reduce the risk of cavities. Call us today to learn more about making healthy smile choices or to schedule an appointment with our team.